Otodex Veterinary Ear Drops are a fast acting formula to clear wax, relieve scratching and kill ear mites in dogs and cats. 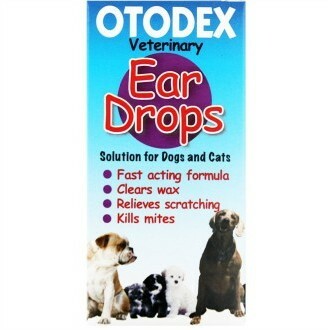 OTODEX VETERINARY EAR DROPS contain a wax solvent to remove wax, fungicides and bactericides, including an anti-bacterial which is particularly useful against common and difficult-to-treat bacterium in chronic ear cases; a mild analgesic to relieve pain and an emollient to moisturise the skin. Symptoms of ear diseases: Shaking of the head persistently for a few moments due to irritations in the ear, such as the presence of parasites, wax or inflammation. Excessive wax in the ear often leads to infection later. Scratching of ears is a symptom of ear mites.